General Characteristics: Medium in height to tall, stiffly erect, maturing within 9 to 12 months, producing two or three branches; characterized by large, somewhat ovate leaf blades and dark green petioles with dark brownish-purple on lower portion. Petiole: 80 to 90 cm. long, dark green tinged with brownish-purple, dark brownish-purple on basal third, fairly broadly edged with pink to whitish, a dark reddish-purple ring at base with lilac-pink-flecked area for 1 to 3 cm. above. Leaf blade: 45 to 50 cm. long, 35 to 40 cm. wide, 35 to 45 cm. from tip to base of sinus, ovate, thin in texture, medium green; margins undulate; piko purplish; lobes obtuse, sometimes overlapping, with narrow sinus. Corm: Flesh white with pink apex and yellowish fibers; skin pinkish-lilac to purple. 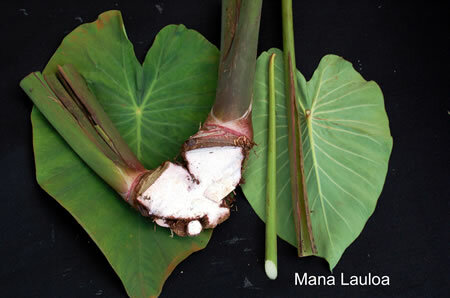 Origin, and derivation of name: Native variety; Lauloa refers to large leaves.